In Home Photo Studio, you'll find plenty of tools for fixing all sorts of problems on your digital pictures. From one-click auto enhancement to handy brushes, there's everything you need to save any shot. Quite often, an otherwise great shot is spoiled by some unwanted objects in the background, such as strangers, shadows, wires and powerlines, tree branches etc. If you want to remove these, there are basically two ways to deal with the task: either change the background completely or wipe off the unwanted object. Both are easy to do in Home Photo Studio. If you prefer the second way, the Clone Stamp tool is your best friend. It will hide any part of the image by covering it by pixels from nearby areas. As a result, you'll get a flawless images like the one in the picture below. When it comes to portrait photos, women are hard to please. Wrinkles, acne, oily skin, moles and other blemishes... there are lots of things that can spoil a nice picture. Fortunately, there are effective solutions as well. The Clone Stamp tool lets you magically remove all kinds of skin imperfections with a couple of mouse clicks. Then, use the Blur tool to smooth uneven skin. Just a couple of brush strokes, and your photo is ready for a cover shot! Uneven horizons are one of the most common photography mistakes, especially if you are just an amateur and don't use a tripod. The problem is easily rectified in Home Photo Studio. 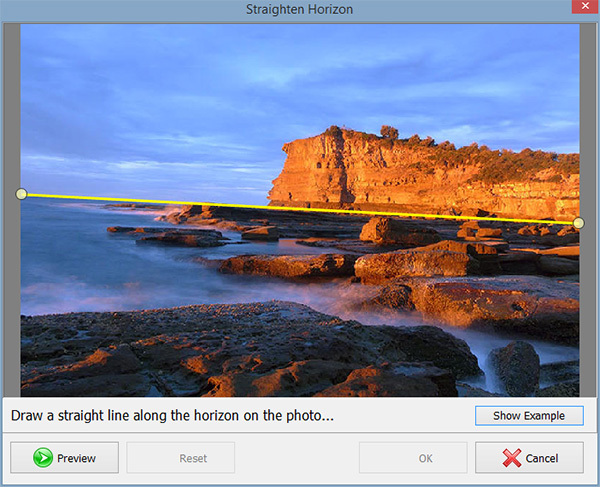 In the "Straighten Horizon" window, draw a straight line along the horizon, preview the result and save the fixed image - as simple as that!